Regional conservation planning is a statutory requirement for the Department of Conservation (DOC) in New Zealand under the Conservation Act of 1987. DOC must prepare 10 year Conservation Management Strategies (CMS) for each conservation region (called a "conservancy"). The purpose of a CMS is to identify conservation priorities and objectives for the next 10 years in the region. 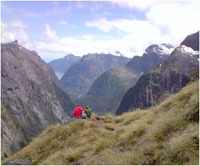 Each regional conservancy contains a mix of conservation lands ranging from iconic national parks such as Fiordland to small conservation areas along rivers. The development of a CMS must include public consultation but there is some agency discretion in how it implements the public consultation process. In 2011, the NZ DOC, in cooperation with the University of Queensland and the University of Waikato, developed New Zealand's first internet-based PPGIS systems to assist in the development of Conservation Management Stratgies for the Southland and Otago Conservancies on the South Island of New Zealand. PPGIS appears ideally suited to help idenify regional priorities for conservation. Households in the Southland region and visitors to conservation areas were invited to identify their values, experiences, and development preferences for the conservation areas in the region. A data viewer for displaying selected PPGIS results from the Southland region is available here: Southland Participatory Mapping Results. Click on the different data layers to view density maps of selected PPGIS attributes. Some conservation priorities can be inferred from the spatial results. For more information about mapping attributes for regional conservation planning using PPGIS, contact Greg Brown. To learn more about how NZ DOC plans to use the PPGIS data in the CMS planning process, contact Rebecca Heenan at DOC.